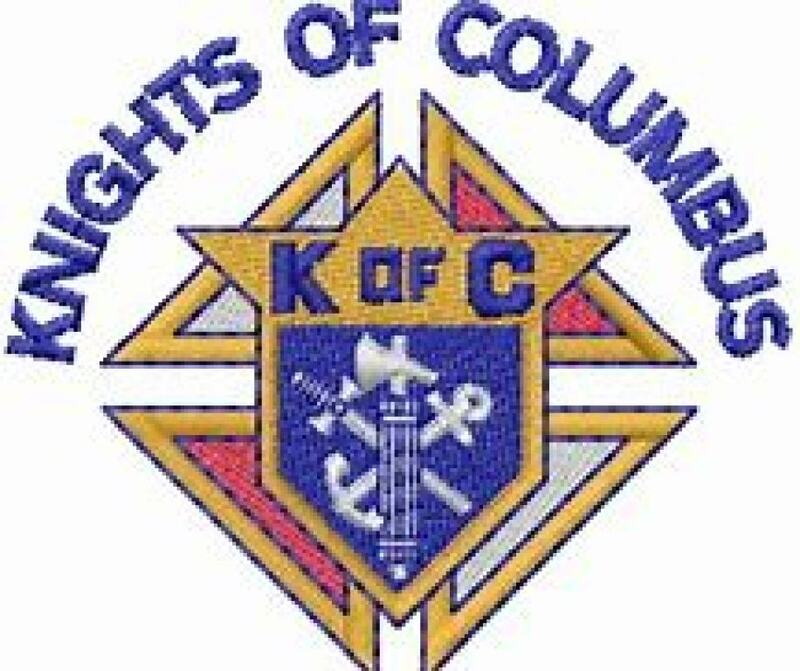 Knights of Columbus provided a dinner for Catholic Campus Ministry at the CCM House on Faculty Street on Wednesday, March 20 at 7:00 PM. The entrées were Macaroni and Cheese and Spaghetti with Meatballs and Sauce. There were also salads, breads, and desserts with ice cream. If anybody left hungry, it was their own fault. The Knights really outdid themselves with this one. 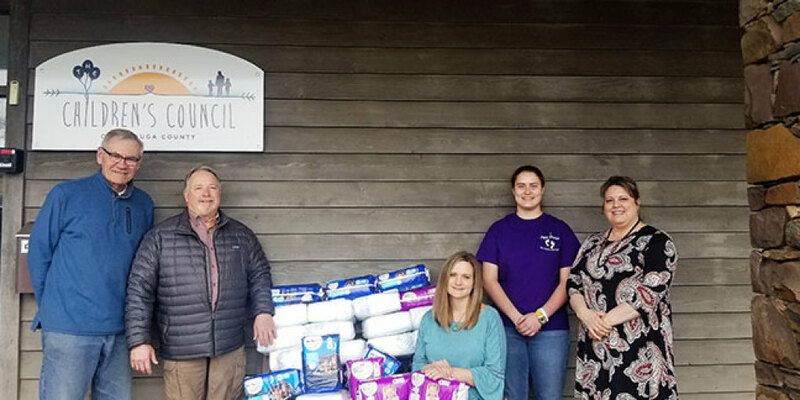 The Habitat Weekends are scheduled for the third Saturday of the month through June. The work is from 9:00 AM to 4:00 PM. Wear work clothes & bring lunch, water, gloves & your own hand tools if you like. Directions to the site are as follows: GreenWood: Turn onto HWY 194 from US HWY 421 South at the Hardees red light at New Market Center. Travel approximately 5.5 miles to right on Big Hill Road. After approximately 150 yards, turn into Green Valley Elementary School. Take an immediate left onto GreenWood Valley Drive and follow the short drive to the end of the road. Contact Marty Corts for more information. 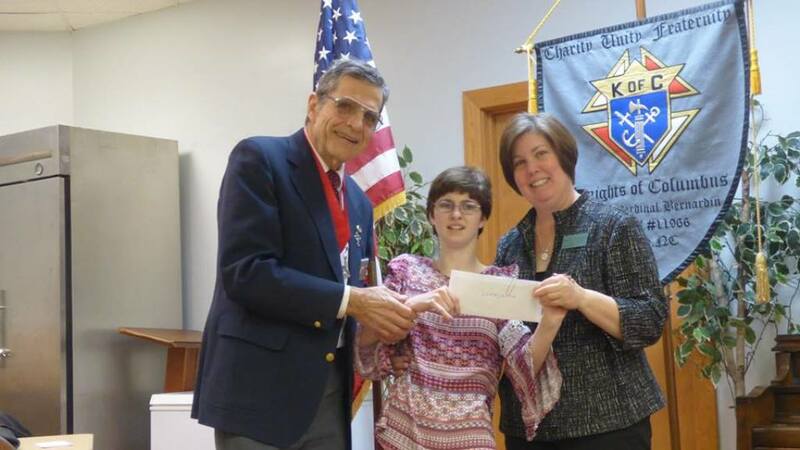 The Knights of Columbus March Monthly Meeting was on Monday, March 11 at 7:00 PM in the Pat Jones Hall. This was on the second Monday of the month instead of the usual third Monday. Meetings will return to the third Monday of the month after March. 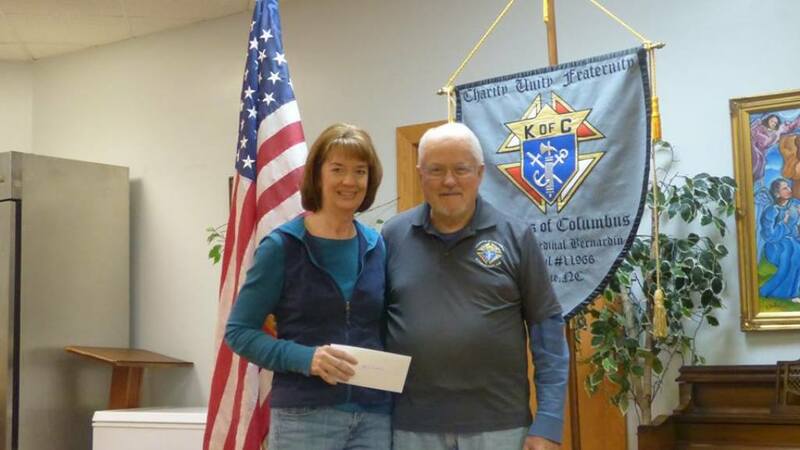 Before the meeting, Grand Knight Mike Parichuk announced grants to four charities with checks from the Boone Council's LAMB campaign collections for 2018. Those charities were Able Recreation (represented by Melissa Shore, presented by Ed Bromeier), iCamp (represented by Jack Sharp, presented by Gary Tuberty), Watauga Opportunities (represented by Michael Maybee, presented by Bob Barnes) and Life Village (represented by Candace and Erin Lang, presented by Jim Taylor). Congratulations to Greg Corallo, Richard Ghent, Hugh Hubble, and Cameron LaBrutto who continued their journey to full Knighthood by completing their Second Degree in Wilkesboro on Wednesday, February 27. 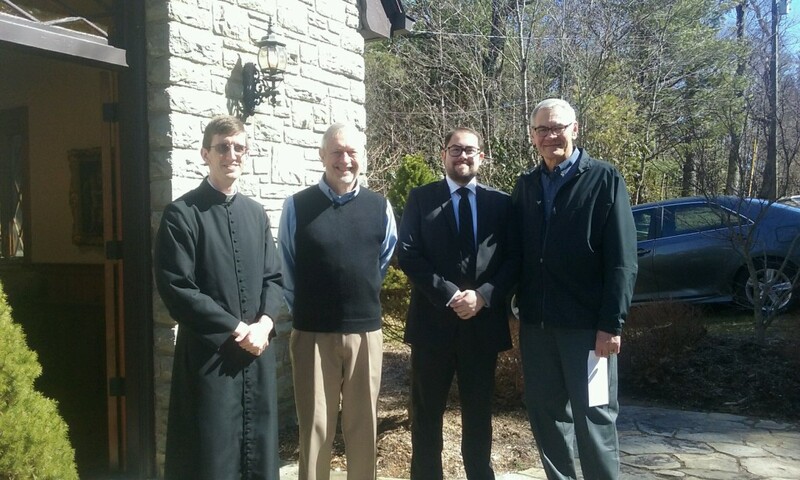 Father Matthew, Paul Welsh, and Mike Parichuk recently presented a $500 check to one of our own, Nelson Woodbury (second from right) who is a Seminarian in Columbus Ohio. 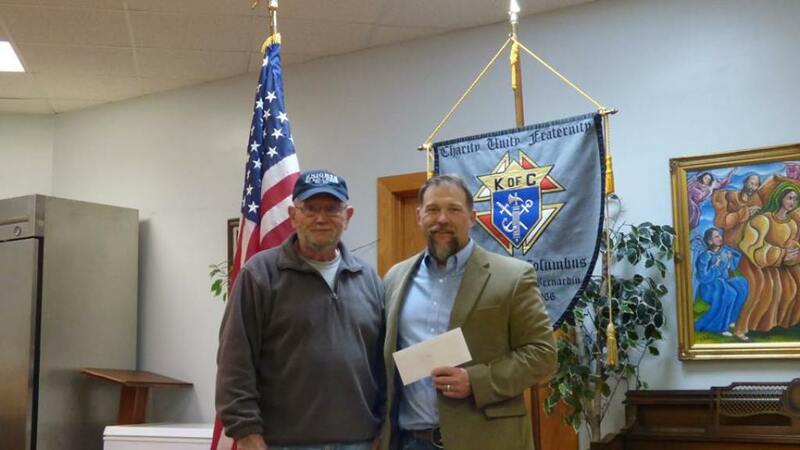 This check was presented on behalf of the Knights of Columbus, Boone Council to assist the seminarian with expenses as he completes his studies for the priesthood. 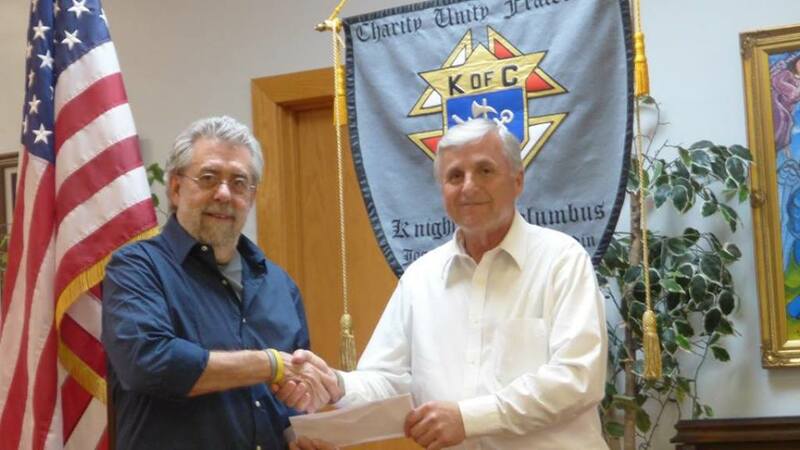 A check was also recently presented to Michael Camilleri by the Hickory Council of Knights of Columbus for the same purpose. Knights of Columbus provided a dinner for Catholic Campus Ministry at the CCM House on Faculty Street on Wednesday, February 20 at 7:00 PM. The entrées were Larry Miners' legendary Macaroni and Cheese and the famous Sox chili. Ed Bromeier's bread and Matt Bagley's dessert were also very much appreciated by all. 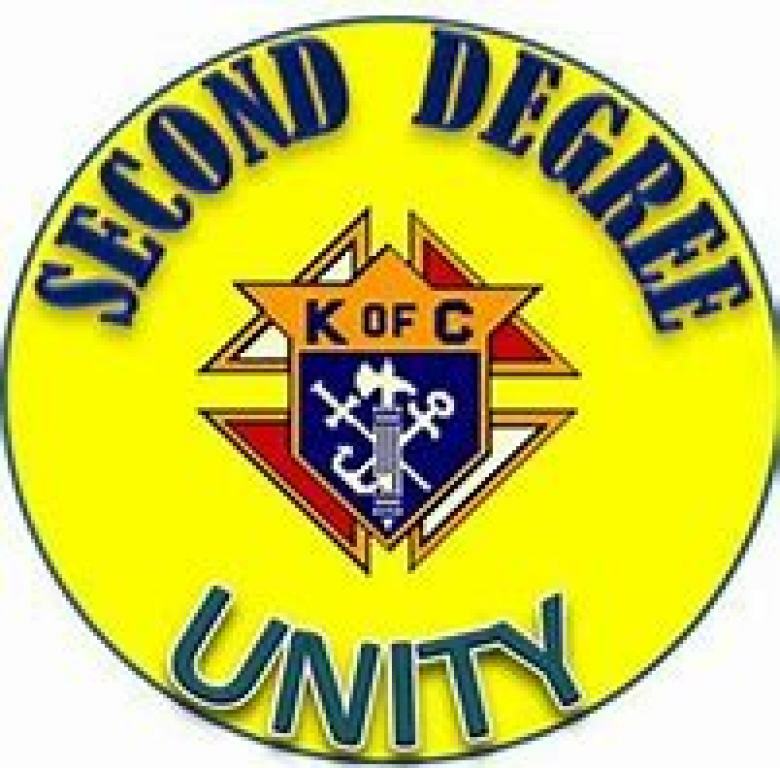 On Sunday, February 17, the Knights of Columbus held a 1st Degree Ceremony for four candidates in the Pat Jones Hall after the 11:00 AM Mass. Attending Knights proudly welcomed Richard Pedroni, Matthew Rupp, Richard Ghent, and Cameron LaBrutto to the Boone Council.